Can honey cure a cold? home > health > immune system / Can honey cure a cold? Many of us turn to a warm drink made up of honey and lemon when the symptoms of a cold hit but why exactly is this remedy so popular? Well, apart from being super tasty, this drink can actually help to ease your symptoms. In this blog I focus on how honey tackles coughing and sore throats so that next time these things develop, you’ll be able to get rid of them swiftly! Lots of research has been conducted into the effects of honey on cold and flu symptoms and so far the results have been promising. Unfortunately it isn’t exactly clear how honey helps the likes of coughing and sore throats however, it could be to do with the texture. Honey is thick and soft meaning it could have a soothing effect on irritated throats. Antibiotics have been in the headlines a lot recently with many experts describing a crisis situation. That’s because our reliance on these drugs has increased massively over the past few years and this means they could lose their effectiveness in the near future.2 As a result, many doctors and scientists are now on the search for an alternative and when it comes to colds, honey could well be the answer! Also, these recommendations state that antibiotics actually do little to improve symptoms so as there has been some positive research around honey, this offers up an effective alternative. Many of the cold remedies we turn to time and time again come can come with side effects such as drowsiness. Therefore, honey offers a natural solution to cold symptoms whilst also avoiding the downside of conventional treatments. Your local supermarket will probably contain a range of different honey products however, if you are using it to treat your cold symptoms then quality is essential! This is where Tiana’s 100% Raw Active Flower Honey comes in. During the production process this honey isn't heated which creates a deliciously rich taste, plus the end product also retains more vitamins and minerals. I’d recommend mixing this honey with a cup of warm water and some lemon for the ultimate cold treatment. It’s both refreshing and comforting and should see you on the road to recovery after a couple of days! Alternatively, if you’re loaded up with the cold and are after a bit of relaxation then Heath and Heathers Organic Green Tea with Manuka Honey is ideal! Manuka honey has anti-inflammatory properties that could help soothe a sore throat whilst the steam from the hot drink itself could reduce nasal congestion. Overall the drink has a sweet, pleasant taste that should help you unwind! Although honey can bring a range of benefits, there are a few things to bear in mind if either yourself or a family member comes down with the cold. First of all, and most importantly, honey is not recommended for children under the age of one because it sometimes contains bacteria that can cause infant botulism. Honey won’t cure a cold, but it can help to reduce symptoms! 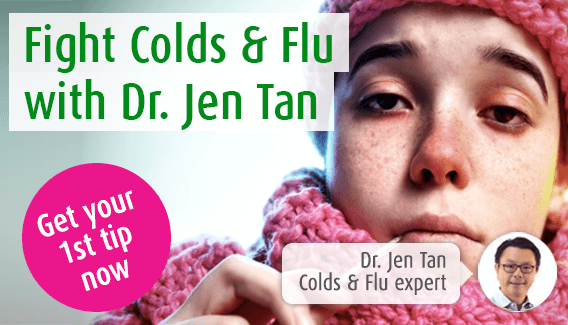 Have a read of my blog ‘How to beat colds and flu’ fast for my top tips on beating colds quickly. In the meantime though, you may find it useful to try one of our herbal remedies. Our Sinuforce Nasal Spray for example, can provide relief from nasal congestion and catarrh which often become troublesome during a cold. For other symptoms such as headaches and muscle ache then you could turn to our Echinaforce Hot Drink. This is made from fresh Echinacea which supports the immune system. The addition black elderberry on the other hand, gives it a fruity taste. So, with the availability of herbal remedies and natural products such as honey, you should be able to shift that frustrating cold quickly!